Many see a place for a downtown arts district. To Paul Fejko, who envisions doing just that in Chester, it's a necessity. "Much of society has forgotten that the arts are part of a normal, civilized culture," he said last week, sitting in the first of his proposed theaters, a dollhouse-size cabaret at the corner of Fifth Street and Edgmont Avenue. "The arts are a way to solve many problems." "Does he have any money?" said Mayor Wendell Butler when asked about the proposal. "Let's be realistic." Even Fejko's newly hired publicist, Don Newton, thinks his boss may be overreaching. "Where Paul says six [theaters], I say three." If Fejko's idea of persuading city officials and big donors to help him turn abandoned buildings into a complex of theaters and concert halls seems overly ambitious, his vision of a thriving arts community in this distressed town may be closer to reality. With a new 20,000-square-foot cultural arts center scheduled to open in 2007, local artists see the opportunity to put the arts front and center in the redevelopment of Chester's dodgy downtown. They recently formed a new alliance, called Chester Arts Alive, to bring together local and regional performing-arts groups such as the home-grown Freeman Cultural Arts Complex and Malvern's People's Light & Theatre. Since December, it has presented a 12-day holiday festival and a Juneteenth celebration. A fall festival is planned for Sept. 16 to 18. There's also a new mural arts program with $10,000 from the city for the first two murals. The goal is to "orient the community into this culture of the arts" before the new arts center is built, so that the group can hit the ground running, said Tara Jones-Stephens, interim director of Chester Arts Alive. The center is part of the $20 million federal HOPE VI project, which will demolish decrepit public-housing towers on a tract near Interstate 95 and replace them with senior housing, apartments and affordable homes, as well as retail and office space. It's the third HOPE VI project, funded by the U.S. Department of Housing and Urban Development, scattered throughout Chester. 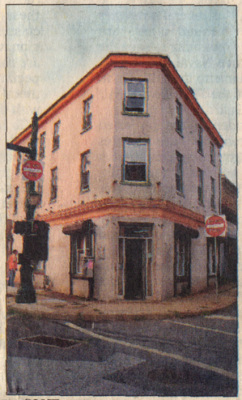 The Andre Cafe, a live-music venue, was created from a run-down former pharmacy at Fifth Street and Edgmont Avenue. Acts ranging from the traditional to the avant-garde play every Friday. Owner Paul Fejko envisions opening five more theaters in Chester as part of an arts district. 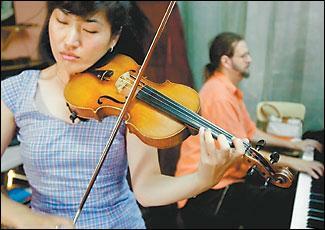 Violinist MoonSun Lee warms up for a performance with Paul Fejko at his Andre Cafe in Chester. Fejko created the live-music venue out of a former pharmacy and plans to create five more theaters. "This type of a facility can help revitalize the area by bringing people back to Chester. It's also a way to encourage young people to stay in school and get them off the streets," Rosenberg said. "It will be the start of an arts renaissance. There's a lot of vacant former warehouse space. If this catches on, you'll find artists moving into those spaces," he said. It's already happening at Fifth and Edgmont with the Freeman Cultural Arts Complex, a gallery and art school on one side of the street and Fejko's cafe on the other. "It's not a Chester focus," Stephens said of Fejko's grand plan. "We're trying to draw a different crowd. The things we're trying to do are more community-oriented." Fejko, who supports his cafe with a day job as a lighting designer, said he was invited by a city representative to open his cabaret, which has hosted acts from the traditional to the avant-garde. He bought the run-down former pharmacy for $2,000 and spent a year cleaning pigeon droppings from the floors and walls. The city, "has been supportive, at arm's length," the ponytailed Fejko said. "They did give me the building, but they say I have to have the requisite millions if I want any more." He's trying to get grants and donations, but just paying for the shows, at $1,000 a pop, is tough. David Sciocchetti, executive director of the Chester Redevelopment Authority, said he liked what Fejko has done with the Andre Cafe but whether there will be an actual arts district remained to be seen. "You can't just draw a line on a map and say that's an arts district," he said. "Hopefully if Mr. Fejko and other artists agree this is a positive environment, we'll have an arts district." And that may be harder than fixing up old buildings. For now, Chester Arts Alive is trying to put together a board of directors to run the new arts center. So far, it includes Jones-Stephens; Delores Freeman, owner of the Freeman Cultural Arts Complex; Newton; and Sonya Pappas, a spokeswoman for Rosenberg who is helping with the center. Clearly the ones who benefit will be the people of this problem-ridden city. It's already starting to happen. On a recent afternoon as Fejko played his piano, a handful of elementary school-age boys wandered in to listen. Soon they were striking the keys and touching the piano strings, while Fejko gladly obliged their requests for things like "vampire" music. "This," he said, while segueing into circus music to the delight of his audience, "is Chester's future."